Today wasn't supposed to be a book review day. But it is. So I hope you like books! Last weekend I had to stop at the local bookstore (and by that I mean Barnes and Noble. But doesn't it sound so much more quaint and romantic to say local bookstore?!?) to pick up a copy of Silver Linings Playbook which we are reading for the Bon's Book Club in May. (If you haven't picked your copy up yet, get on it!) While I was there I got quite lost, as I always do in bookstores. I wandered from book shelf to table to easy chair to book shelf. Is there anything so magical as getting lost in a book store? An hour later I realized I was 30 minutes late for an engagement party and was buried deep in several different books. raced to get out of there, but the book I couldn't stand to leave behind was The Happiness Project. I was on a strict "No spend April" but I justified it, as I always do for much wanted items, and before I knew it I was headed out of the bookstore with not one, but two books. I told myself I had to read Silver Linings Playbook first because I have a deadline since we are discussing it May 30. 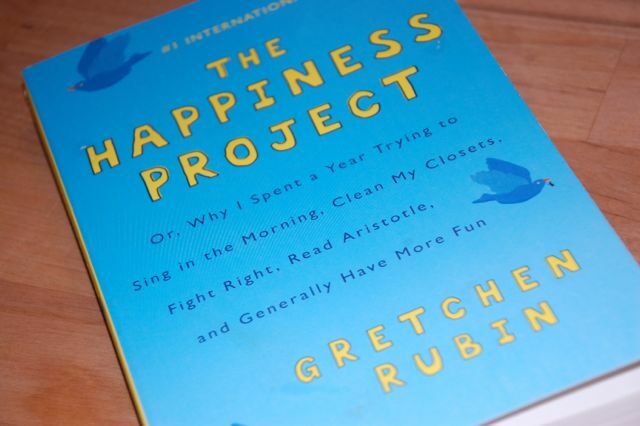 Confession: I read only two pages before I was yearning for Happiness Project. It's not that I didn't like Silver Linings... I was just so immersed with Happiness Project that I decided then and there I would have to finish it before I dared read anything else. The author describes her project as this. She's not depressed. She's not unhappy. She just realizes she could be happier. According to studies, 50% of our happiness depends on genetics, 10-20% of our happiness depends on our life situations, and the other 30-40% of our happiness depends on our own attitudes about life. Meaning we can, completely on our own, increase our happiness up to 40% if we make small changes in the way we live our life. I have so many blessings and my life is filled to the brim with joy and peace. So why do I get ornery? Why do I snap at my little sister? Why do I focus on stress and anxiety instead of the plethora of blessings that surround me? 1. I get annoyed with people too easily. I feel like if I were happier I would have more tolerance for people who are prone to get on my nerves. 2. I complain too much. I usually try to stop myself, but sometimes before I even realize what is happening I have been complaining for 30 straight minutes and I only feel worse for it. 3. I let myself be overwhelmed by the negative, instead of focusing on the positive. Why do we always seem to focus on the one thing in our life that is going wrong instead of allowing ourselves to enjoy the hundreds of things that are going right? The concept of the book is fascinating. The author decides to focus each month on a goal that is going to bring her more happiness. I have gotten through only January and February, but it is seriously all I can do to not stop writing this post write now and bury myself in the book. January she focuses on goals that will give her more energy- going to sleep earlier, exercising, decluttering the house, etc. February she focuses on goals that will improve her marriage- showing more appreciation, quitting nagging, and fighting right. I feel like I have learned so much from this book already and it makes me so much more aware of my mood and the attitude I am giving off to others. -I have fallen into the category of those people who are often less considerate of their spouses than other people. I will make Greg wait instead of making other people wait. I will complain more to Greg, be harsher on Greg, and get annoyed with Greg more than I will perfect strangers. Interesting that I choose to treat Greg this way when I love him more than anyone in the world. Time to switch this one around. -"There is no love, only proofs of love." Basically what this means is that if we aren't showing our love, then there is no evidence that the love is there. We can't just assume people know we care about them, we have to constantly show it. If we love someone we need to tell them, do acts of service for them, listen to them when they need it. If I am not showing Greg (or others... this expands to all relationships in life) my love then there is no love. - Stop expecting praise for my work or for Greg to suddenly want to help out with whatever I'm doing. If I decide to clean out the closets it's because I'm doing it for me. Not for Greg. That way I don't feel resentful if he doesn't immediately praise me for how clean the closet is or volunteer his services. Working out is for me. Cooking healthy dinners is for me. Blogging is for me. It's okay if Greg doesn't do back flips when I do these things because they are not for him and if I realize I am doing all these things for me then I don't have to be frustrated with Greg for not helping out more with things that are entirely my decision. -Don't postpone anything that can be done in less than a minute. This helps with general clutter and cleanliness and keeping on top of all the little tasks we have to do. Hanging up clothes, replacing the toilet paper, cleaning out a cereal bowl- those can all be done in less than a minute and so should be done immediately. -"Make a list, do a little bit each day, stay calm." I loved this line from the book because I feel like it especially pertains to my stage of life right now as I am frantically trying to apply for jobs in California, get my California certification, run a growing blog, and finish up a successful school year. It's all about doing a bit every day and just staying calm. I've rambled on long enough and I'm determined to get 7-8 hours a night of sleep so I'm signing off. (According to the book "a bad night's sleep was one of the top two facts that upset people's daily moods... sleep deprivation impairs memory, weakens the immune system, slows metabolism, and might, some studies suggest, foster weight gain." Wowzers! I'm learning so much!) I suspect I will be writing much more about this book as I'm only 62 pages and already I feel like it is life changing. I encourage you to read it, if you haven't already and then tell me about it! Maybe I'll have to choose it for a 2014 Bon's Book Club read because it really is phenomenal. I am listening to The Power of Habit right now on audiobook. It's amazing. I think I'll put this book next. It sounds like they'd go well together. I'm gonna need to download this on the kindle stat! This book sounds great. I think everyone can use a little reminder to focus on happiness once in a while. Nice insight, I'll have to check it out. You are very introspective, which is good. I want to read the book you told me about Amsterdam, I'm currently reading Ann Frank's diary. I meant to telll you that I really liked your post and responses about what mormons believe. Way to stick you neck out there! Don't snap at Mary! And now it's time for you to post on myfamily!! First Sunday of the month, REMEMBER?? Oh how I LOVE this book! I read it a couple months ago and could not put it down either! I just loved how she was able to point out all those not so good things about my life without even trying to do so. And I have totally adapted her motto to "tell yourself you are happy" and let me tell you it works! SO excited for you to finish the book! I have been wanting to read this book so you've just pushed me to do so! Good luck with your self-improvement projects! I read this last year and absolutely loved it. Glad you enjoyed it, too! I read this book around Christmas last year, and I ADORE it. I recently read her second book, Happier at Home, and I liked it just as much, if not more. I'd highly recommend that one if you liked The Happiness Project. A line that I find myself repeating still, months later, is "Don't let perfect be the enemy of good." I still don't think my husband fully understands what it means to me, ha! But I'm so Type A and such a perfectionist that I sometimes don't begin things at all or spend way too much time on certain things that just really don't HAVE to be perfect to function well. Ah, such a good book. Refreshingly written. This looks like a book I should read as well! Thanks for the advice! thanks for sharing, I'm definitely going to get The Happiness Project now.. it sounds amazing! I am in the middle of this book, and think it is great. It isn't one I have struggled with setting down, but it still has such great ideas! I follow the author's blog, but I have yet to pick up the book. I've always struggled with happiness (mainly from health reasons) but since getting help for anxiety, I've learned just how much we CAN control our own happiness! I loved this book and found myself taking quite a few little things from it each time I picked it up. She just came out with a new book that I haven't read yet, but if you like her, sign up for her Happiness Newsletters that get emailed or grab the desk calendar. I've been wanting to read this book for months now! I best get on it! Loved this book! In terms of recommendations, have you read 'Gifts of Imperfection' by Brene Brown? Or any books by her? She's fantastic. Funny that you should mention this book--I've been a reader for Good Housekeeping for awhile now, and my absolute favorite column every month is by Gretchen Rubin. When I finally figured out that she'd written a book the other month, I've been plotting ever since on how I'm going to be able to afford my own copy (since I'm also watching my spending, and I'm also a teacher so I don't have that much money!). I liked this book as well. Her second book was good but didn't resonate with me as much as the first book. I would recommend reading Happiness at Home when you need another jolt of happiness energy. Have fun reading Silver Linings Playbook - I have to add this to my GoodReads list! This is one of my all time favorite books!! I'm starting to read her next one, Happier at Home - also very good!! Thanks for sharing about this book. I'm off in search of it now. My friend gave me this last year because I was in a similar mindset. I loved it! YES! I just finished this book and the whole darn time I was like um, Gretchen are you me??? I've been really trying to act how I want to feel. It's hard, especially on days like today when a parent goes behind my back to my principal, but man I'm trying! Can't wait to hear what you think of the rest of the book! I'm sold. I'm ordering this book today. I need to read this book! What great insights you gave us, and it will challenge me to think more positively myself! I just bought this book randomly this weekend and got two chapters in...I am so excited for more! First, I'm beyond stoked to read this book! Thank you for posting about it! Second, I am always so inspired after reading your blog. Your voice and stories are always so eloquent and beautifully vulnerable. I find so much strength and encouragement in the honesty of your writing. It challenges me to improve my writing, and to challenge myself to let others see the tender parts of who I am and what I've experienced. Thank you for breaking through the blogging barriers out there! A friend of mine from law school was reading this book, so I downloaded it for my Kindle and it's just been sitting on there, gathering E-book reader dust! Reading your post has inspired me to get started on it ASAP - it sounds like it might be exactly what I need! I tend to do the same thing like you, plan to buy just the book i need to in the bookstore and later emerge from the bookstore with at least two books. I need to read this book ASAP after reading your reviews.